The world was gripped with anticipation this week, waiting for the longest and most bitterly-fought battle to see who would usher in a new era as president and with it possibly a first female American president. No, I’m not talking about the election to vote in a new leader of the free world (otherwise known as the president of the United States of America). Obviously the voting process to elect a new World Squash Federation president (and team of vice-presidents) was far more important, and took slightly longer to produce a result. Unlike the American voting process, which went all geeky this year, the WSF election was interrupted by a wedding reception booking the room they were in and delegates had to resume the voting during a function that evening at a different venue. Donald Trump, who claimed the electronic voting system in America had been rigged earlier in the week, surprisingly failed to demand a recount after the result sent a 70-year-old megalomaniac misogynist into the White House, where a full-time wig fitter will be on the Oval Office payroll for the first time. Hillary Clinton’s aides blame a group of influential American politicians who were so busy lobbying the voters in the global squash election to choose Natalie Grainger that they failed to do enough to stop a former television reality show host from being given access to the nuclear button in Washington. It will be interesting to see if promoter John Nimick invites Mr Trump to the forthcoming Tournament of Champions in New York, where the two reigning champions, Mohamed Elshorbagy and Nour El Sherbini, both represent the Muslim nation of Egypt. The final at Grand Central Terminal is one day before Mr Trump’s scheduled inauguration on January 20, although his forthcoming federal fraud trial might get in the way. I also wonder if the women’s world racquetball champion, Paola Longoria, from Mexico, will be required to climb over a wall (not sure if it’s the back wall, front wall or side wall) to be allowed to compete in America. In squash, the delegates had assembled in Hong Kong one year after an acrimonious annual meeting in Nice had blocked an attempt by outgoing president Narayana Ramachandran, from India, to change the rules to allow him to stand for a third term. There was nothing nice about the atmosphere in Nice. Mr Ramachandran was accused of gross mismanagement, failing to involve the PSA in the Olympic bid, and all sorts of other stuff, and became so agitated by the wave of personal attacks that he threatened to sue anyone who questioned his single-minded success. It was single-minded because he was the only one in the room who thought he had been a success. Even squash lovers in India had rallied against him, demanding that the government cancel an award made to him after questioning the accuracy of his boasts about his own generosity. 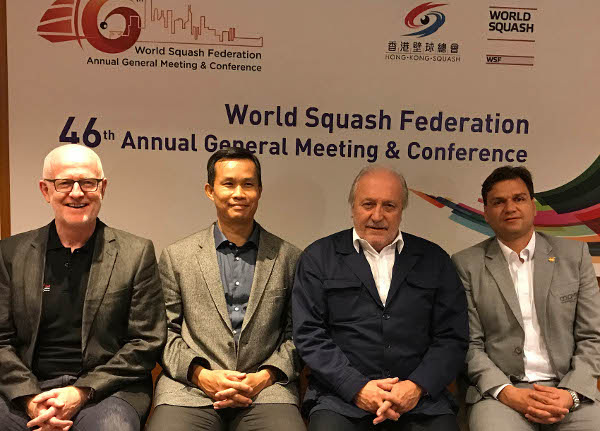 In the spirit of transparency promised by the new WSF president, a group of delegates has asked Squash Mad to share the news of the voting process that took place in Hong Kong this week. NEWS UPDATE: Following the meeting, sources in Manchester claim that England Squash may now be looking at a Brexit strategy after Ms Zena Wooldridge, the president of the European Squash Federation and England’s nomination for the presidency, won the vote only to be forced to stand down within hours following a dramatic recount demanded by Jacques Fontaine of France. Apparently, it turned out to be a long and stressful procedure. The voting process for the election of a new president began at 11am on Wednesday, November 9th. The four candidates, Natalie Grainger (USA), Mohamed Menshawy (Egypt), Zena Wooldridge (England) and Jacques Fontaine (France), needed two ballots and a final head to head vote between Zena and Jacques to get Zena announced as the new president of WSF at 12 noon. After the applause and handshakes, Rich Tea biscuits and cups of tea, now the procedure began to process the election of four vice presidents. There were nine candidates: Pablo Serna (Colombia), Gerald DeCourcy (New Zealand), Sarah Fitz-Gerald (Australia), Gar Holohan (Ireland), Huang Ying How (Malaysia), Linda MacPhail (Canada, an existing VP), David Mandel (president of Squash Australia), Stephen Mann (president of Germany – squash that is, he hasn’t taken over from Frau Merkel just yet), and Syed Nawab (Pakistan). Nigel Farage failed to make the short-list. To find the first VP the first election round required eight polls. Each took on average 15 minutes. After a little more than two hours Huang Ying How from Malaysia was confirmed as the first VP. Meanwhile, Jacques Fontaine questioned the result of the presidential ballot, which led to a recount. This confirmed a wrong vote count from the first ballot and the result was corrected to be a draw, with an equal number of votes for each candidate. This situation required a repeat of the head to head election round between Zena and Jacques. This new round showed a majority of votes for Jacques. He was duly appointed as the new WSF president around 3pm. After the baguettes and Beaujolais Nouveau had been cleared away, and a quick glance at the rulebook, the WSF constitution demanded that they had to start the election of vice presidents all over again. This time it took just six polls to get the first round’s earlier winner, Mr How, reconfirmed. But now the next problem was showing up. The conference room was booked for a wedding and the hotel management asked the WSF conference to leave the room by 4.30pm so they could bring in the cake and set up the disco. It was agreed to continue the VP election during the evening function at the Happy Valley horse racing club. It took another two hours there to get the other three vice presidents elected: Pablo Serna (Colombia), Gar Holohan (Ireland) and Sarah Fitz-Gerald (Australia). In total, including the candidates’ presentations, it took more than eight hours to get a new WSF board elected. It was a long, hard day for all the delegates, the election moderator Andrew Shelley, and the Hong Kong Squash Federation staff who were helping to collect and count the votes. The change of venue was also a major disappointment for those squash delegates who fancied crashing the wedding party karaoke after a few expenses-paid visits to the bar. This was an epic election nobody in the WSF will ever forget. In years to come, people will ask the question: Where were you when Jacques Fontaine was elected president? Since the results were announced, there has been rioting all over America, but we are reliably informed that this has more to do with the outcome of the US presidential election which took place at the same time. Donald Trump’s narrow victory was confirmed one hour ahead of Jacques Fontaine’s eventual triumph in Hong Kong. Trump used to call in to the Don Imus radio show on WNBC in New York. Trump seemed pretty liberal back then (he probably still is). Trump talked Imus into appearing at an event in Atlantic City, but then to save a few dollars Trump booked Imus into a cheap hotel, not into his fancy one. Imus found out about it and hit the roof, and finally Trump was forced to call back in and switch the reservations on the air. Imus replayed the bit for years, and it was funny every time.